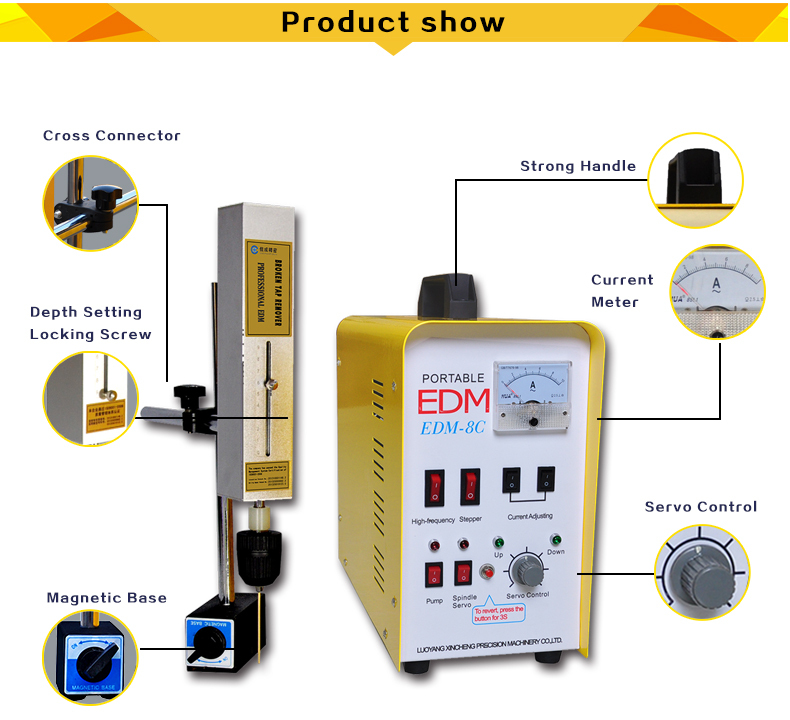 800W EDM-8C Portable EDM Drilling Machine Remove Broken Stud Broken Tap Remover can fast remove broken taps, drill, drift, screw, plug gauge, etc., without damaging to the work piece, easily process on work pieces at any size, especially effective for large machine tools. The integral construction of this machine left a space for storage at the bottom of the power box which is convenient for managing the attachments. 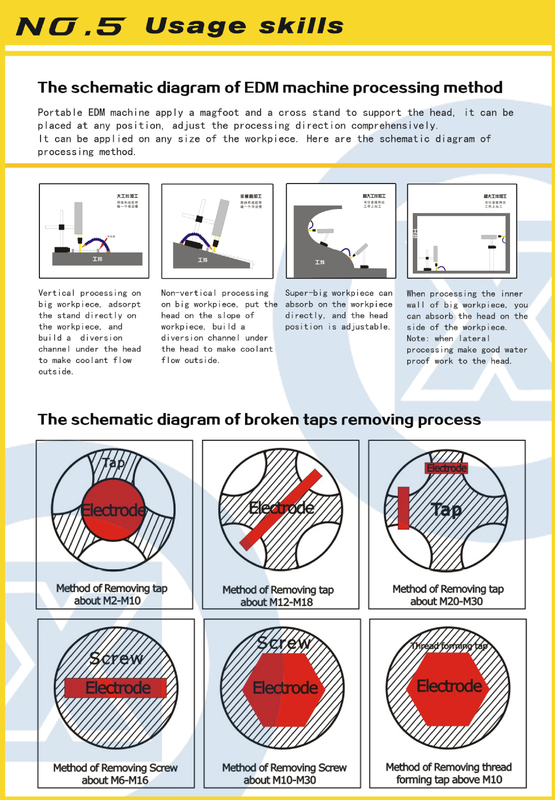 With a high efficiency in processing, it could remove broken tap, screw and is especially good at processing mark. 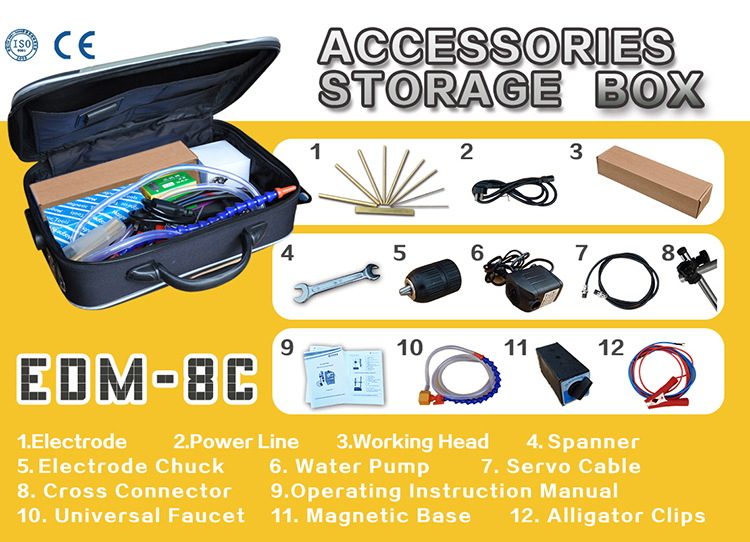 Working part: power box, operation panel, work head, water pump, magnetic base. 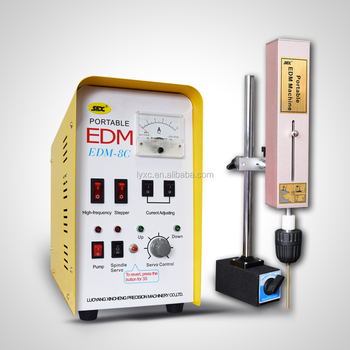 Power box: The power box of PortablE EDM is portable designing unit. The carrying handle on the top of power box is good for carrying. Assist devices: power cable, high-frequency cable, control cable, water pipe, magnetic external water supply pipe, electrode chuck, adapter sleeve, etc. 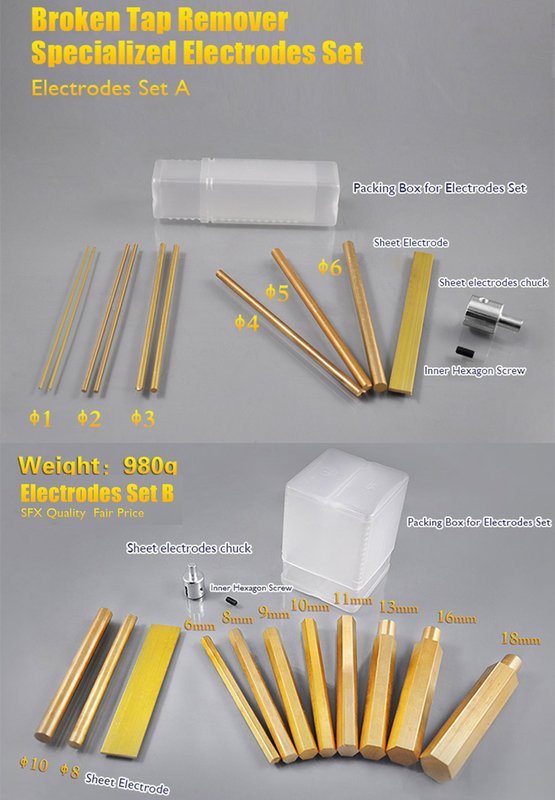 Consumptive materials: brass tube, brass bar, hexagon electrode, brass sheet. 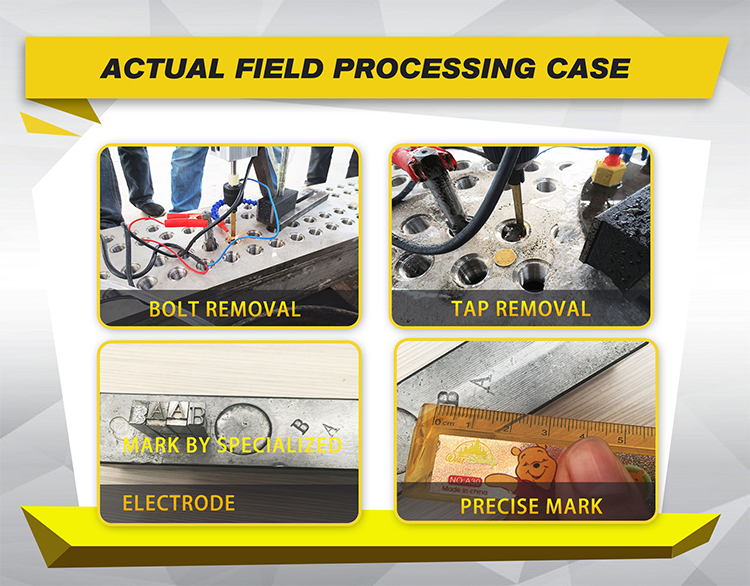 Electrode discharge area is generally about 0.3mm diameter larger than themselves. For example, an electrode of 3mm diameter could process a hole of 3.3 diameter. 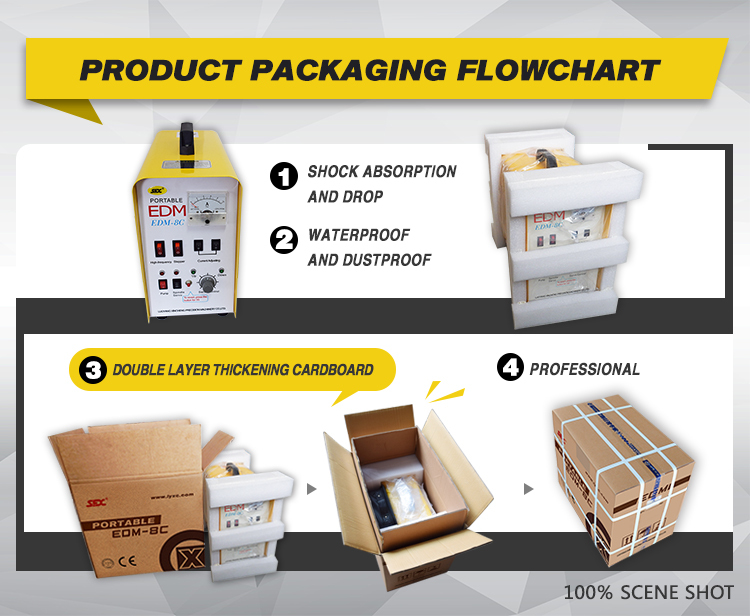 The electrode should be chosen according to the actual processing conditions to avoid injury to thread and the discharge area should be considered. Taps above M20 can be processed by several times. Method Recommended: drill a straight, triangular, square or hexagonal groove, and remove it with matching tools. 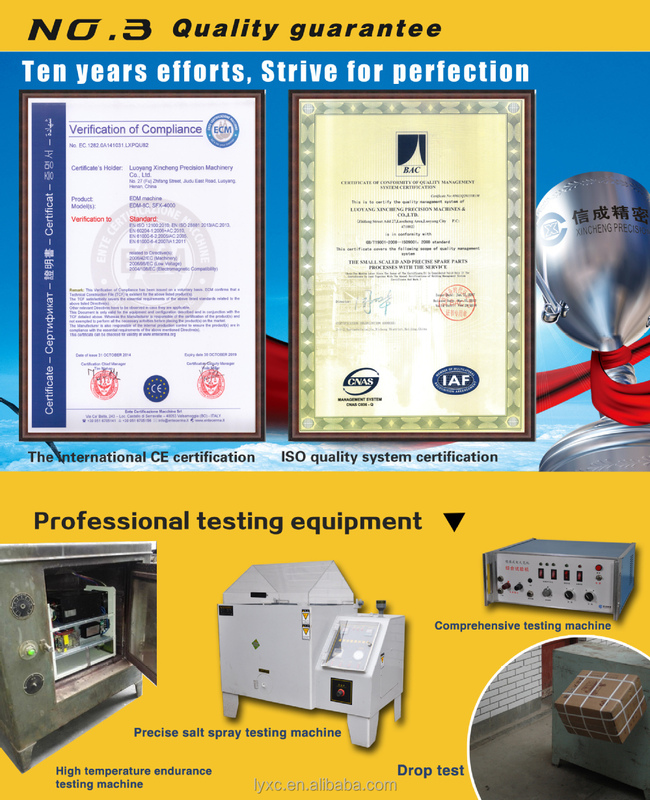 Answer: Sure, the standard equipment is for 220VC+/-10%, 1 phase, 50/60HZ input voltage, while a transfer will be matched for lotal voltage, by the way, if the quantity is enough, custome design is available. Answer: Yes, a water pump is included in the parts,and you need to buy nothing else to start operating. Answer: The chuck won't rotate when machine working. 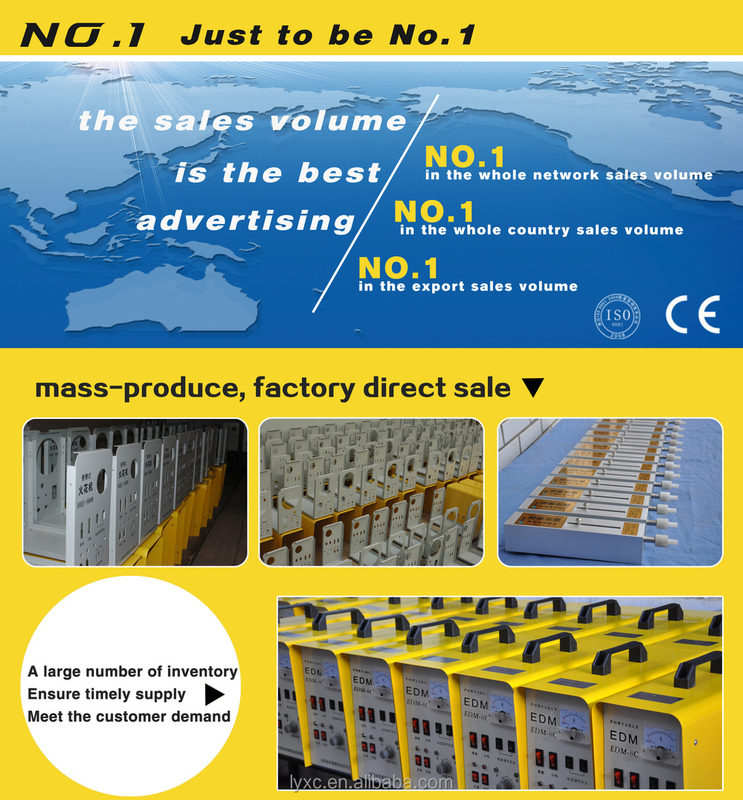 Answer: The machine will be delivered from our factory within 72 hours after the 100% deposit checked. Answer: We accept T/T, Western Union, Paypal, etc payment terms. First of all,our product will have to go through a thorough quality exam process to ensure that our devices won’t have any glitch before delivery. Secondly,the warranty period is usually around one year and within this time frame,if there are any technical problems,we would repair them for free including the new parts that needed for the repair. PS:we would offer free repair only when the damages are caused by technical deficiencies of the product itself, not man made errors, namely,the damages were done by mishandling the machine.repair.